Pardon me, friends, for I have been away for a few days to Greensboro, NC watching her skate to gold at the US Nationals. This was a Christmas gift from my husband. It might have been more appropriate a few years ago when I really skated a lot, but he was definitely trying to give something I'd like. Seriously, what was wrong about sending me to Houston or Paducah though??! The trip had ups and downs, too many to really count. If you get the chance to watch the mens competition (I believe it may be shown next weekend, but it may have been on yesterday afternoon), it's the best of the events. The guy that won the event is a total riot, and spectacular skater too. Obviously I don't have much but my hopes and dreams to show you for my quilting for this past week. I did some handwork and lots of sketching, mostly drafting the applique that will go on the new quilt I have started below. I'm using the kaleidoscope blocks as a watercolor backdrop for some magical applique. I may even do it on the machine, who knows. These are all batiks, and they are so much more vibrant in person. Lastly, here's a couple of blocks for a swap...the last of the committments for my monthly block swaps. It feels good to have those done! We're in for yet another mid-week snowstorm on Wednesday. I just cannot get a sewing morning while all 3 kids are at school whatsoever. I am behind on quilting work because of it. I may have to do a few evenings after they go to bed to get caught up. I'm sick of snow. We probably have 18" on the ground and they are predicting at least a foot more! At least I escaped it for a few days for slightly milder 40's and 50's! Short on words today. Even shorter on time. This has been finished a couple weeks now and I am just getting pictures posted. The busy sashings were challenging for me. I like to utilize sashings to help ground sampler blocks when they are all different. In this case, the busy sashings all seem to blend into the blocks, which doesn't do the pretty blocks any favors. They need to show! So, for the quilting, I chose to quilt all of the quilt in an ivory thread, but then used green along the sashings to help to define them. It's subtle, just dual rows of green loopies, but it does help for definition. It's been snowy all the blasted month of January, so I have awful dull lighting for the pictures. I have done several samplers for this client so I struggle each time to come up with something different and unique for her. I hate the thought of being coined a "one trick pony" because I only generate one type of quilting. By way of a Handi Quilter Yahoo group that I belong to, I caught wind that we might be receiving chocolates in the mail. Allegedly they were supposed to go out before the holidays, but seriously, this is more fun now. In the middle of December I had more cookies and candies than I knew what to do with. On about Dec 28, I sent all remaining sugary goodness to work with my husband so I wouldn't eat it. Just yesterday, I was cursing how gosh awful trying to take off 5 pounds is because I LOVE chocolate. About 15 minutes ago, this arrived via UPS. It's a rather unassuming box, not rattling like chocolate truffles might. So I decided I needed a pre-dinner peek (aka "taste"). Upon opening, I find a 5"x9" slab of brown goodness. OMG, this is delightful. My kids were begging for a bite. But how could I bite into this?? OK, the only thing keeping me from sinking my teeth into this is the fact that it is frozen! Is that not just fantastic?? 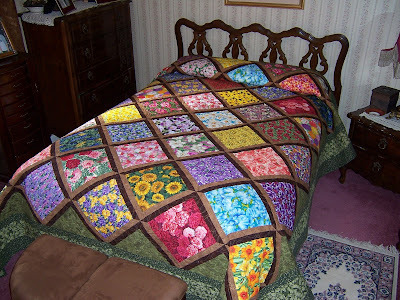 ...and yes, Miss B, that is your quilt beneath it, and I was most careful to keep it spotless. In the next day or two, I will do a reveal on this Fig Tree sampler quiltmade by one of Maine's more prolific quilters. It is very pretty. Remember this post? ?...where I showed ideas for some alleged quilt. I have decided I probably have enough sandy-toned batiks. I embarked on the first 9 blocks this week. The jury is still out on how much I like them! Nearly 2 months ago, I bought a cone of Essential PRO thread from Connecting Threads. I have bought their cotton thread back right after I got my longarm. I call this back in my "I didn't know any better" days. It was before I knew that cotton was messy and linty. Before I knew it would break much more often than polyester. Before I knew that it was too thick to possibly look good for detailed quilting. None the less, it was inexpensive at Connecting Threads, and I stocked up on many colors. I quickly learned that I liked the Superior SoFine thread SOOO much better, bought hundreds of dollars of it and tossed the troublesome cotton aside. It actually was all sold (aka given away) at a garage sale last May. I am halfway through a client quilt. I have not had a break or thread nest or anything unsightly. I am using Superior prewound Bottomline bobbins (only because they are simple and I happen to have ivory!). The thread tensioned just fine and it seems to sew basically like a So Fine. The best thing though is that it is much cheaper. Sorry, Superior...I do love that thread, but for more basic colors that I use a lot, it is nice to have a cost saving alternative when everything else (ie., cotton) is increasing in cost. I happen to buy from Superior at wholesale prices, which are 40% less than their website retail costs. As a comparison, the Essential PRO gives you 553 yards per $, in comparison to the SoFine at 330 yards/$ and the Bottomline at 400 yards/$. I won't put the retail comparison because it is obviously a better deal if you are a wholesale customer, so for those that do not run a business, the cost benefit is even greater. Hugely greater. This would be an ideal thread for piecing. Think about that - How much is a 500yard spool of thread??...$3-4? You can get 3300yards for only $6. If you spend $50 at Connecting Threads, the shipping is free. I usually spend $8 (though retail/non-wholesale shipping is $3.95) at Superior for a $100 order. Drawbacks? ?...sure, there are always drawbacks. SoFine comes in a plethera of colors - 135 to be exact. Bottomline comes in nearly 60 colors. Unfortunately, the Essential PRO comes in only 30 colors, but they are fairly commonly used shades so I think that I'd use many of them often. I don't get a cut back from the store for this review. I just thought that it is good information that quilters, whether longarm or domestic could benefit from. So, go shopping! Spend what you save on thread on something fun to pamper yourself with. Whe I realized that I had not posted since Monday, the reality of my week began to settle in. It's been busy and not always in a good way. I am still dealing with the draftsman that is drawing up the prints for our house remodel. Seems everytime I get a revision drawing to correct one thing, he has botched something else. It just makes me silly. Wednesday delivered us with our 2nd snow day of the year. All 3 kids were home from school, as we got nearly 15" of snow. Good thing I got awesome new snow boots recently! After our 1st snowstorm of the season last month, I realized my old boots (which were not really very comfortable anyways) were nowhere to be found. The kids all loved the snow, but dear old Mom isn't that fond of having to snow blow and shovel! Afterall, it was a day when I should have gotten 5 hours of quilting in, and I barely got 1. Whoa is me. I am very soon to be taking this off of the frame for the 2nd time. It's not officially completed, but is much closer. I have one border (or maybe 2) that I need time to reconsider, and get going on some customer work before my trip in 10 days and my kids's vacation next month. The next picture shows what the quilt looked like when I took it off the frame 2-3 weeks ago. There are places unquilted, and places I have altered. Pay perticular attention to the rosette. I liked the idea of doing the concentric lines along the rosette, but they proved to be hard to do well. Once I removed the blue marking pen, I was mildly horrified how crooked many of them looked. On top of that, I was never really committed on how to do the black & green background behind the rosette. After I had requilted the areas of the borders that I showed last post, I started ripping this center out. It is the quilt's focal point, and just cannot look crappy. Here's what I came up with. I have done radiating rays every 5 degrees through the rosette and through the interlocking border. Then I decided that it would be nice to feather the rosette spokes since the detail quilting shows better on the lighter fabrics. It looks decent on the ivory. The light gray was a total pain to quilt because the fabric has lousy visibility (lotsa mottling). I think it still looks alright. At any rate, it is better than my first attempt. 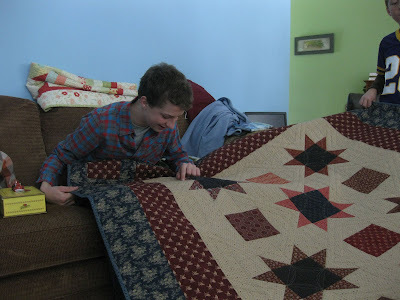 It ought to - it took about 6-8 hours to pick out and then about 8-10 hours to quilt. I know, hard to believe. The visibility or lack thereof just slows me down a lot. Plus there are lots of stops and starts to have to bury. Now the thing with this rosette that I have not mentioned yet is that it has a problem. Oddly, I have yet to get too worked up about it. Considering I am a Type A, I am very surprised that I have not completely flipped. Afterall there's about 75 hours in this so far, just in the quilting. What have I done, you wonder? ?...When I pieced each of the 15 degree sections for the rosette, I had to hand cut the pieces since they are curved. I traced templates with an aqua sharpie pen, then cut them out. Before I sandwiched the quilt, I noticed some of the aqua pen on the edges of the medallion pieces and shrugged it off, thinking that it had to have been heat set given all the ironing they went through. Hmmph. Famous last words, Fool. The first time I tried to remove the blue marking pen, I started seeing little bits of aqua. Holy crap. I couldnt believe my eyes. Well, now I am in hard persuit of a remedy for the pen. My readings onthe internet indicate that these pens are not really permanent, and that the right amount of patience, repetition and choosing the proper removal method can (WILL) get the staining (OK, now bleeding) out. I looked rather suspicious at the grocery store buying four bottles of rubbing alcohol. I have tried that on the frame, but I will get more aggressive once it is off - trying stain stick, full immersion and other suggested tricks. I hate to resort to a bleach pen because it will affect the back of the quilt, but it's better that the front look acceptable than the back! If ANYONE has a remedy for these pens that they thought worked, please tell me! And the quilt does have a name now, but you will just have to wait for a grand reveal. I have arrived at that arduous task which always stumps me. It is time to actually give this quilt a legitimate name. My husband and I struggled with both of our boy's names. I stubbornly wanted Henry both times, so I failed to budge on agreeing on a name until labor started. I got to use the name Henry when we adopted a cat. I have been calling this my "Italian Floor Quilt" for quite some time now, but it really needs something more showy or as my daughter would say, fancy. Somehow seeing the quilt label reading "Italian Floor Quilt" seems a little too boring and simple for the 70 hours of hell the quilting has put me through! So, please...Give me your thoughts on a name (ie...leave a comment!!). I have had this back on the frame for 5 days now, and progress has been good. I haven't had too many issues other than that things have taken longer than I expected. What else is new?! I filled in the area between the cathedral windows with that "clover-shaped" motif. It is really a shape from the Venetian architecture. I have thought long and hard on this quilt as to how to bring in the architecture to the design. The clover shape is going to also be used at the center of the rosette. The peachy border was completely picked out (4 hours of ripping), and something similar, yet denser, was quilted back there. I still want to do something down that center area to make the 2 intertwining paths "pop", but I haven't gotten there yet. And at the suggestion of someone at MQResource, I have put 3 mostly parallel lines in each of the 0.75" gold and ivory stripes. For those of you that do not longarm, please don't think that this was a fast effort. It was anything but fast. I think it took about 4-5 hours (much time spent burying threads too!). On a longarm, these are stitched with a straight template, and careful, careful guiding of the 43lb machine. The corners took forever with the intertwining sections (5 sections per corner, and 6 thread buries per section - you do the math). I was skeptical about how they'd look, and if I really could sew the lines straight enough, but I am pretty sure I love the effect. I also did a bit of fill-in on the center. Now the medallion rosette has to be largely taken out and restitched once I figure out how to do the curves neater than I did them the first time, but I want to get everything else redone first. This weekend, I did the rays out of the rosette. They are every 5 degrees. And today, I did the very much micro-quilting of the gray-brown 1" border that surrounds the rosette - the one that has the very tight feathering. It is only a 26" square, but this feathered border took about 45 minutes. I am off to planning 2-3 more customer quilts and then I should be ready to get back on this bad boy...that should be just about the time I am headed to North Carolina for this! I have a client that is a prolific quilter/piecer. She brings me several quilts at a time, and frequently brings more when she pick some up. Seems I always have a box of her's to quilt! Here are two more... This is a fun and interesting pattern...many, many little pieces to perfectly align in this pattern. The pink, orange and green make a lively quilt top - and we all know how I love pink and orange together! The back is a nice green. She asked for an edge to edge, so I selected this panto. The pattern name escapes me right now. It's big at 84"x96". Here's another of her's. This is much smaller, maybe 42" square. It is one she plans to donate somewhere I think. The hot pink backing has hearts on it so I free quilted hearts in the pink blocks. The rest is just loopy. I have my quilt back on the frame for a few days of "redo", then I am onto a couple more client quilts. This is the time of year that is predictably slow in terms of receiving client quilting jobs. Last year was very slow for a couple months after Christmas, then it took off very busy for 8-9 months. So...if you are out there and are considering having a quilt longarm quilted, I could do it for you now with a relatively quick turnaround! Send me an email msolomo1@maine.rr.com. I have been slow getting back to the grind of everyday work, quilting especially. It's not that I don't have a few quilts awaiting my creative touches, I just have been swamped with other distractions like kids, Christmas and a draftsman doing the renovation prints that needs a fulltime babysitter (AKA, me). I took this quilt off the frame yesterday. It's going to a client in California. The quilt is all made from lovely Asian, gold-gilded fabrics. 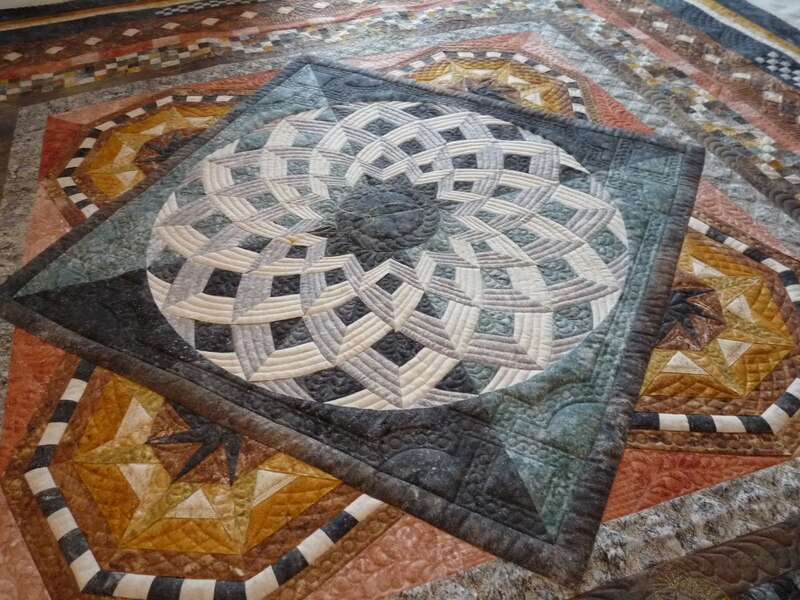 The piecing is simple, yet effective -- challenging for a quilter in some ways because she wants neither a pantograph nor a full-custom. Kind of hard to find a middle ground. The quilting was even further complicated because the backing fabric is icky pale ivory and does not really relate to the top, and since I match bobbin and top threads, every thread I use on the top, shows beneath. Rather than have tan threads all over the gorgeous deep blues, I resorted to the reverse. Not a great looking back, but a happy middle ground I think. I echo quilted around the prominent cranes and moons and tried to connect the focal squares with waves and swirls, to mimic the wind in three shades of navy, turquoise and aqua. The outer border is a big question as to how well it gels with the center, but hey, gotta do something and feathering on that heavily gilded material was out of the question. It was nearly impossible to see what I was doing using templates! There is some curved cross-hatching in areas that are outboard of the bird's flight path, just as filler. I also did some soft blue flowers, a couple dragon flies and some meandering leaves (to match the outer border) in the other non-bird squares. I got a nice email from a local quilter. I did this quilt for her in late November. It was 125"x105", the largest I have done to date. She gave it to her mom for Christmas, and she emailed to say how much her mom loved it. It's a regular flower garden! I got another email recently from another client, showing the quilt she did (and I quilted in Nov) for her son. He was very pleased to receive it. And...(drum roll)...I have become bored showing my other 2 projects which will be a project for a while still, so I have moved onto designing something new. I have not decided if I will force myself to use only stash fabrics or if a small purchase of the backgrounds will be OK. I doubt I have enough of the tan and yellows in any fabric to do the quilt. It probably needs 2-3 yards of each! I designed this using EQ7. I have been hankering to do another feathered star, but with a twist...with a bunch of hand applique. Obviously, the quilt will not have the pointy edge, but I have not figured out how to not have it look this way!